Sunday was our last day’s digging for our 2013 dig of the cottage and its front yard. It was a beautiful day, relatively mild and mostly sunny. Three volunteers were involved in a final search for either a well or water-tank in front (north) of the cottage. A 1x1m test pit was dug down into the yard surface in the area remembered by a former resident from when she was a young child. 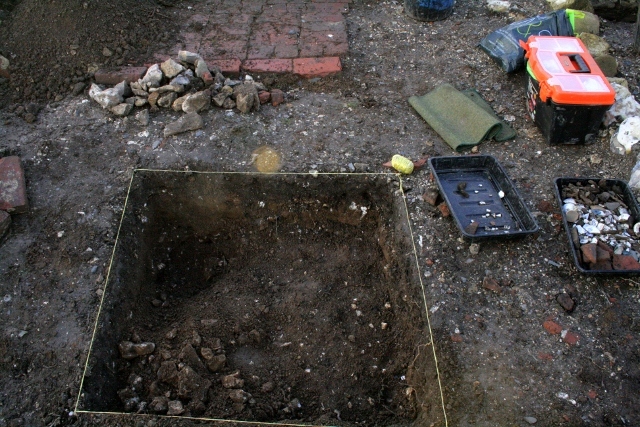 The top 10cm was full of finds, consistent with having been ‘dust’ from the fire as well as broken ceramic and glass used to consolidate the front yard’s surface. The finds included a wide range of decorated ceramics, the best of which was an egg-cup decorated as a chick hatching from an egg, with its head and feet breaking out of the shell. Its feet were webbed – so it might have been an ugly duckling! Also nice was a complicated looking rusty hinged bit for a heavy horse. At its base were a few flints showing some signs of wear on their upper surfaces, but there was no indication of their having formed a continuous cobbled surface. Below it the natural geology of ‘clay with flints’ was met, which was at least 20cm deep. This was completely clean of any signs of archaeology, except at the very top of this context. The yard area was relatively small, so any well or water-tank in this immediate area would have been detected. 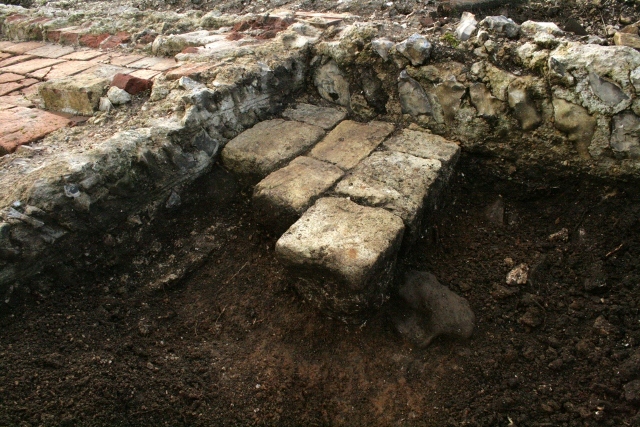 A water-pipe which ran from a large rainwater collection tank in a nearby barn, may have fed some sort of a water barrel or tank which would have sat on the unmortared stone platform in the south-west corner of the area in front of the cottage. A sondage was excavated on either side of this platform in case this was a filter tank which gravity fed a nearby underground water tank. 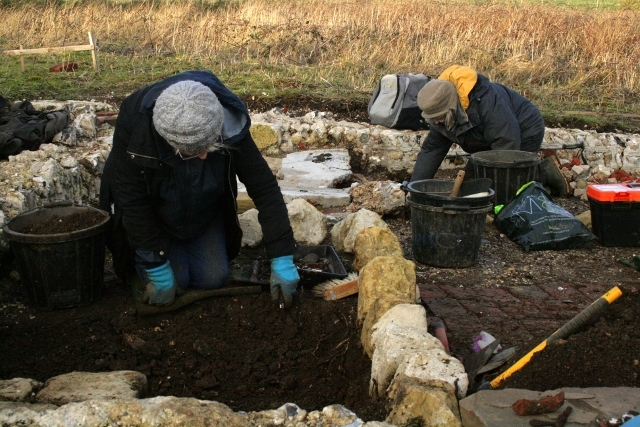 Whilst the top 10cm contained a range of finds, there was no sign of any structures under the original ground surface. The level below it appeared clean of any archaeology, or disturbance. Some very large flints embedded in the surface of the ground between the adjacent front door and the stone platform indicate that they were placed there to access this structure, without getting muddy feet.